This is a great book - perhaps the most compelling biography ever written by a fisherman, and once read, it will haunt you forever. This is Falkus at the very height of his powers and it isn't surprising that the book went on to sell in huge numbers. Even non-fishermen will enjoy this, because most of the book isn't about fishing - after all, it starts with Falkus being shot down in a Spitfire during the Battle of Britain and it ends with him rescuing his father from a near-drowning. This really is a book which deserves the word magical. If you read The Stolen Years - and I really do suggest that you get hold of a copy, because it is the most wonderful book, then I suggest that you also read Some of it was Fun, which is the sequel... or it would be, if you allow for the fact that there is a huge gap between the two, which is only partially plugged by the stories in the two volumes. 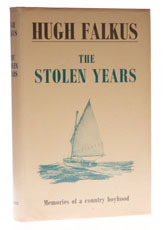 The Stolen Years tells the story of one side of Falk's childhood and speaks of a life which seems full of promise - Some of it was Fun is the tale of a man who has sown the dragon's teeth and finds himself reaping the whirlwind, without any clear idea of why it all turned out the way it did. Angling writers are cursed with a tendency to write stories about their childhood = "tales of fishing with a bent pin" as Billy Connolly once put it in Waterlog. Almost without exception, adult memoirs of childhood don't work, unless they are written by a master, and Falkus was a master. This is how you should write a book. Yes, I know that the truth of some of the stories is debatable, but who cares when they are this good and if you want to fill in the gaps, you can always read Chris Newton's no-punches-pulled biography of the man, although I suggest that you leave a few weeks in between the two, just to let the magic seep into your soul before you wash it away with a cold dose of reality. Read this before you die? You bet.